Groundnut in full flower, climbing over low plants. Click to enlarge. This is a plant that I’ve seen growing since I was a small child but had no idea what it was. This will be my first post about this interesting bit of botany, as the flowers are in bloom now and I want to show you so you can see them in the wild. I will be using it in the kitchen later in the Fall so watch for that post. I used to call this plant “that flower that smells like raspberry cheesecake ice cream.” Because to me it really does smell that way. Groundnut is actually quite an interesting plant. 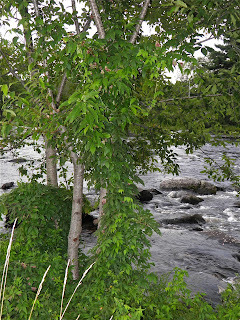 It is a vine that likes to grow along the edge of flowing water. 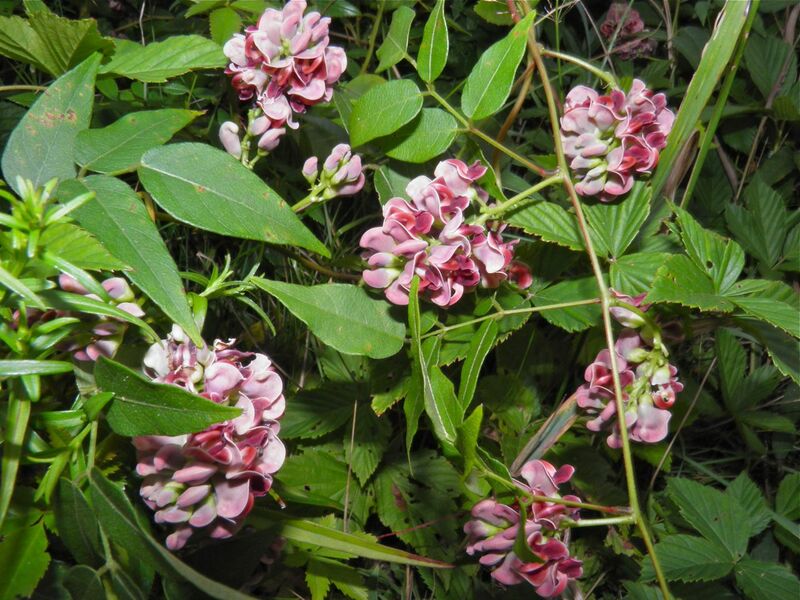 It is a member of the pea family and has dark reddish/brown flowers in dense racemes. They are so tightly packed together that they almost form balls. Their habitat in Canada is from Nova Scotia to Ontario. Further west they are less common. They are also prevalent in the Eastern United States. One web site said that the “thrive” on riverbanks. I don’t think I would call it thriving. These things are absolutely rampant. They will scramble over, under and up pretty much anything they encounter. The individual vines can be quite long. I have pulled up ones that were easily in excess of 12 feet. All along the vine length are leaves coupled with short stems of flowers. The groundnut was used as a food source by the native Mi’kmaq. They harvested the tubers. Before the founding of the village where I grew up (1860) the area was the summer campground of the Mi'kmaq. The river teemed with salmon and trout, and I imagine the presence of a great deal of groundnut was also a factor in the choice. The Mi’kmaq called groundnut "sequbbun." Sequbbunakade in their language means “groundnut-place.” The town, lake and river of Shubenacadie in Nova Scotia are most likely a poor attempt by European settlers to spell the Mi’kmaq word. It was the Mi’kmaq that taught the Europeans to harvest them for food. There is record of French setllers harvesting them at Port Royal in the Annapolis Valley as early as 1613.
tree to a height of about 10 feet. Click to enlarge. Other names for groundnut are Hopniss, Mi’kmaq potato, Indian potato and traveller’s delight. A healthy plant will have at least two and upwards of 20 tubers. They can range in size from a grape to a grapefruit. Tubers the size of an egg are quite common. Wow. This bodes well for me when I go harvesting in October. It's not that I'm afraid of a little work, but even if they're of medium size it won't take long to get enough for a recipe. Groundnut tubers contain 11-14% protein, which is far higher than any other common root vegetable and rivals that of wheat. The amino acid profile matches that of beans so the tubers complement most grains to form a complete protein. Groundnuts are crunchy and nutritious and the taste is supposed to resemble chestnut, which is slightly sweet. They become sweeter after the first frosts. They also have a somewhat more nutty flavour when baked. Groundnut beans (from the flowers) can be eaten raw or boiled like peas. The tubers can be boiled, fried or baked. Since they have a low sugar content they have tendency to not over-brown when fried. Tubers can also be dried for storage. The dried tuber then can be ground into a flour. Groundnut can be harvested all year round (but are best between Fall and Spring). But remember that the tubers are sweeter after frost. The beans would have to be harvested just when ripe which would probably be in about 4 weeks from now. If I can reach them at this time I will probably do a post on the beans as well as the tubers. Instead of pets following me home I seem to have that problem with wild plants... I actually have had success replanting a little of this in my own garden. It's taking a while because the soil is dry in comparison to a riverbank, but it's growing. Maybe in years to come I won't have to leave my yard to have a harvest. I can’t wait to try this one. 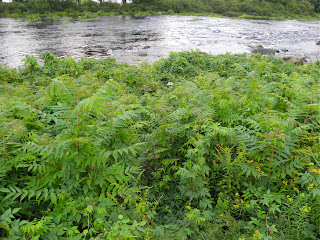 There’s a riverbank I know that is absolutely covered with them. If you drive by in Autumn you may see me bent over with shovel in one hand and a bucket in the other! When I post about this again it will be with a recipe. Count on it. I was wondering if you ever found Apios Americana? I am looking for some tubers that I can use as starting stock for growing them in my apartment in Ottawa. If you happen to have any and wouldn't mind sharing it would be really great.